Requesting Public Records: Requests to the Florida Supreme Court for official public records should be made in writing pursuant to Rule of Judicial Administration 2.420 to publicinformation@flcourts.org. Rule 2.420 is the judicial counterpart to Florida's public records statutes, Chapter 119. Court documents filed earlier than February 1, 2015, may be available only from the Florida State Library & Archives under state records laws and rules. For good an sufficient reason, the Governor may petition the Florida Supreme Court to impanel a statewide grand jury to investigate crimes or wrongs of a multicircuit nature. 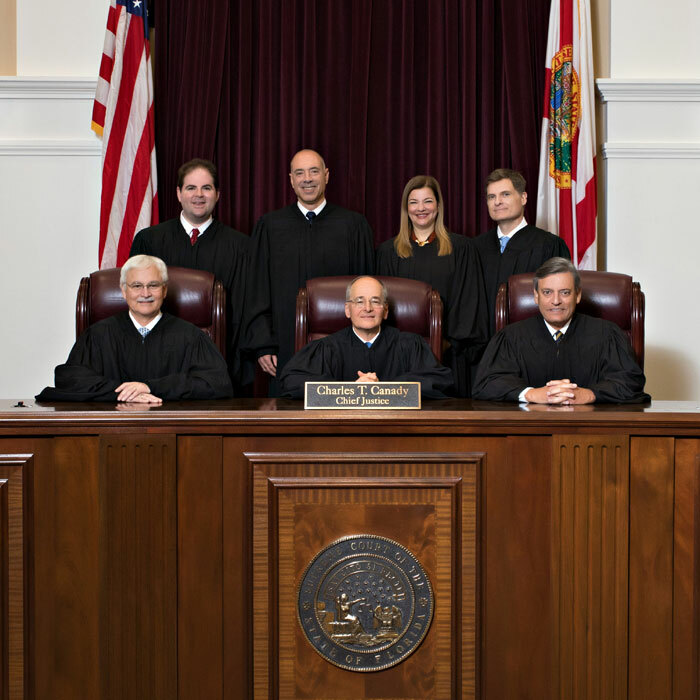 Each year the Supreme Court issues its opinion certifying the need for new judges throughout the State of Florida, an annual requirement imposed upon the Court by the state Constitution. High Profile Cases are cases with high public interest. Follow us on Twitter to receive notifications of filings in these cases. The Public Information Office uses Twitter to push out information about high profile case filings, opinions, emergency information, and official court business. This general need-to-know information for the press includes attending oral arguments, videotaping, satellite downlink, court broadcasts, and more. Press Releases dating back to 2005 are found on this page. Summaries of oral argument cases are written to assist the press and public. They are typically posted Friday afternoon before oral argument week. The court schedule includes oral argument weeks, court holidays, and dates of other court events. This page lists the most recent death warrants signed by the Governor and the related cases. You can learn more about inmates at the Department of Corrections Website, which includes a Death Row Fact Sheet. A listing of pending Florida Judicial Qualifications Commission (JQC) cases involving alleged misconduct by Florida state judges or involuntary retirement of a state judge due to serious illness. Official reports of the Florida Supreme Court are located on this page. The range of reports and studies include jury service, gender bias, racial & ethnic bias, workload study, guardianship monitoring, judicial branch governance, and more. Florida's judicial branch publishes statistical information, such as caseload data, judicial certification data, and jury management statistics and publications including annual reports, long-range and communication plans, and an official newsletter. Resources include the Internal Operations Manual, the Operation and Jurisdiction of the Florida Supreme Court publication, and links to Florida Rules of Procedure. Learn about the structure of the state's highest court and Florida's court system. Ethics rules governing judges forbid the Justices and their legal staffs to talk with anyone about pending cases or to explain or elaborate upon an opinion the Court has issued. Read more to understand why. Authored by the Media & Communications Law Committee of The Florida Bar, the handbook serves as a resource guide for members of the media about topics in the legal profession. You will be redirected to The Florida Bar website. Information and news about supreme court justices and the Florida Supreme Court.